In a conversation in Chuokoron with Atomi University Professor Hiroshi Mitani, the University of Tokyo Professor Tadashi Karube noted, “There is a significant gap between the commonly held historical perspective, and the accepted perspective among historians,” referring to the Meiji Restoration, which took place 150 years ago in 1868. Mitani stated that one misunderstanding was that in the final year of the Tokugawa shogunate (1867), Japan was split between two opposing factions: sabaku (supporters of the shogunate) and kinno (supporters of the emperor). He emphasized, “This is a major misunderstanding. In reality, after control of the country was returned to the emperor, two factions were formed and being fighting: a faction supporting the Tokugawa family playing a central role in restoring imperial rule, and a faction seeking to eliminate Tokugawa as part of the restoration. 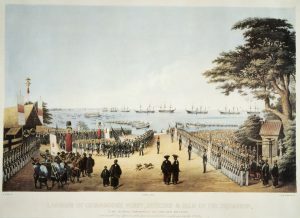 Although this year marks the 150th anniversary of the Meiji Restoration, Karube suggested, “When thinking about the modernization of Japan, it might be more meaningful to celebrate in 2021 the 150th anniversary of the abolition of the han system and establishment of prefectures.” He explained, “This definitively put an end to the class system, one of the most important outcomes of the Meiji Restoration.” Commenting that “It is also worthy of note that no major rebellions occurred” in reaction to the Meiji Restoration, which was “a kind of revolution,” Karube argued that one reason Western countries have difficulties in understanding the Meiji Restoration is that “Despite carrying out a revolution and modernization, the ruler remained.” Karube also criticized being interested only in the Meiji Restoration itself, and argued, “It would be more worthwhile to discuss what deserves criticism and what should be passed on to the next generation” while looking at the 150 years of modern history since the Meiji Restoration.